The KISS swaps are my favorite. I like all of the swaps mentioned and I would like to see the snowflake swap as well. I will be anxiously watching for the schedule to be posted. My favorites are the ami, purse, and teapot cozy swaps. I think they should ask the members what they want the swamps to be this year. Sad to see this go away. Can you let us in on the first KISS SWAP of the year, yet? Yea, so happy to hear people are interested in swaps. And my apologies for being out of touch. I live in AZ but was sent to work in California beginning Nov. 3 and that project ended Jan. 28. Then I was sent out to work on one of our reservations out here. Believe me when I tell you there are still lots of places in the US where there is no cell phone coverage and intermittent Internet access. Life just happens sometimes, you know what I mean? I love the KISS ideas--keep them coming! In the past we have done granny squares, dishcloths, hot pads, your choice cozy (chapstick, tea, smartphone/tablet/ebook reader/etc. ), scrunchies/hairbands, and coasters. Those are what leap to mind. Can anyone remember others? I think I remember doing a hat and a shawl kiss swap. Well heck we're almost into April and no swaps have been posted yet! Surely there is a schedule put together by now? I wouldn't mind doing one starting on April 15TH!!! Anyone else?? April 15th sounds great to me! KISS exchanges are for small items. We have had shawl swaps (yearly) and hat swaps (intermittently) in the past, but again, because participation has been so low in numbers these past 4 or 5 years, we're not going to be doing any big swaps this year. I'm sorry to disappoint any who were hoping for these this year, but experienced Crochetville swappers know our surveys are very detailed re: preferences. The number of swappers last year was so small that by the time we took into account allergies and smoking preferences, we had some people swapping with the same folks 3 or 4 times a year. That loses it's fun after the second time. But the KISS swaps--fast and fun! One small item, no extra goodies. And now i'm off to post the spring KISS survey. Hope to see you all there! Have the swaps been cancelled? 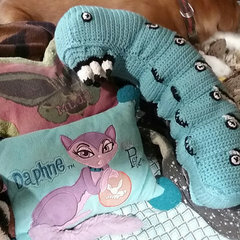 Last I heard from DesertCrocheter, there will be one for the Holidays. I do not know when. Oh I hope so. Even though I cannot always join a swap, I look forward to seeing all the beautiful and creative projects. Are we doing the ornament swap? No ornament swap this year, I'm afraid. Several of our previous hostesses are no longer available to host. But we are doing the stocking stuffer, and you can always make or request an ornament of your partner in that one.